Please join the Greater Riverside Chambers of Commerce, Inland Empire Economic Partnership, Inland Action, Mobility 21, Monday Morning Group, RCTC and SBCTA on Wednesday, Dec. 6 for a holiday reception honoring the California Transportation Commission (CTC). Wednesday, Dec. 6, 5-7 p.m. Since beginning her tenure with the Port of Hueneme in February 2012, the Port has realized several successes. Tonnage totals have grown every year since her arrival from 1.3 million tons for FY 2012 to over 1.575 million metric tons in 2015 marking the Port’s strongest sustained trade years since its inception in 1937. The Port’s revenues have climbed 30.1 percent since Kristin took the helm. Kristin championed the first annual Port Banana Festival, drawing over 10,000 visitors to the Port. Port of Hueneme related activities generate $1.5 billion in annual economic impact and create more than 13,600 direct, indirect, induced and influenced jobs. Most recent successes include securing a $12.3 million Transportation Investment Generating Economic Recovery (TIGER) grant and a $1.5 million Economic Development Administration (EDA) grant. Also under her leadership the Port will be advancing a harbor deepening project in concert with the U.S. Army Corps of Engineers. Prior to serving for the Port of Hueneme, Kristin served as CEO and Port Director for the Port of New Bedford, MA, the nation’s number one value fishing port. Under her leadership the Port realized significant growth in port development, cruise and recreational boating activity. Kristin is recognized by Trade Administration officials for her impressive work in promoting economic development through international trade promotion, and for her service on several federal level shipping and port committees. Kristin was awarded high-profile appointments by the U.S. Department of Transportation to both the National Freight Advisory Committee (NFAC) and the U.S. Marine Transportation System National Advisory Council (MTSNAC). 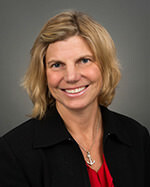 Ms. Decas is the current President of the California Association of Port Authorities (CAPA) representing California’s 11 deep water ports, providing educational leadership and advocacy on issues related to transportation, trade, the environment, land use, energy and other subjects effecting port operations. In 2015 Kristin served as national Chairperson of the American Association of Port Authorities (AAPA), a trade association representing more than 130 public port authorities in the US, Canada, the Caribbean and Latin America. Kristin was the first woman to run both the Port of New Bedford in its 50-year history and the Port of Hueneme in its 78-year history. She was the 4th woman to chair the Association of American Port Authorities in its 103 years. Kristin also supports her community by serving on the Dignity Health Ventura County Community Board and the Habit for Humanity Ventura County Advisory Board. Kristin was awarded Woman of the Year by the Oxnard Chamber of Commerce in 2014, the Pacific Coast Business Times Editor’s Choice Award in 2015 and was among the Pacific Coast Business Times’ Top 50 Women in Business in 2016 and 2017. Kristin also made the list for Pacific Coast Business Times first 2017 report of their “Who’s Who” in Business Leadership. Kristin has been recognized by World Wide Branding as a Top Female Executive in her industry in July 2017 she was awarded the International Association of Top Professionals Top Port Director of the Year. Most recently she was named Maritime Executive of the Year at the Green Shipping Summit USA and the Women in International Trade Los Angeles Chapter (WITLA) named Kristin their Outstanding Women of the Year in International Trade. She lives in Oxnard, Calif. with her husband and is the proud mother of two daughters. Stephen Polechronis is a transportation industry executive and project manager with extensive transit project management experience, including development, design, and construction of light rail, heavy rail subway, and commuter rail projects. His project management experience includes complex multi-disciplinary assignments at all stages of project development from concept to commissioning. Concurrent with his project work, Stephen has held a number of executive positions with AECOM Transportation including his current assignment as AECOM’s Transportation Regional Business Line Leader in Greater Southern California and Nevada. Previously, Stephen had responsibility for the development of AECOM’s Latin American transportation initiative, business development in AECOM’s Western Region, was Director of West Program Management, West Coast Unit Manager, Western United States Transit Director, and West Coast Regional Manager of Business Development. He has held positions with both P&L and business development responsibility. Stephen was the recipient of the 2016 Honorable Ray LaHood Man of the Year Award, Women’s Transportation Seminar, Los Angeles Chapter, is active in APTA, CMAA and the Central City Association of Los Angeles. 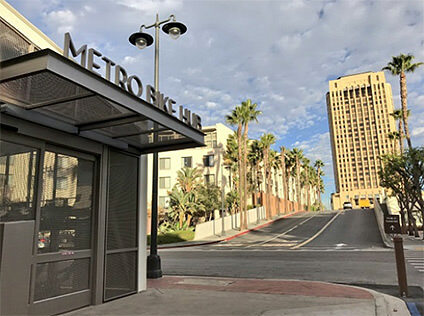 This month, The Los Angeles County Metropolitan Transportation Authority (Metro) announced the grand opening of a new Metro Bike Hub at Los Angeles Union Station, one of the largest secure-access bicycle parking facilities of its kind on the Metro transit system. Located next to the north breezeway of Union Station West near Alameda Street, the $2.5 million, 3,000-square-foot facility can accommodate safe and secure parking for nearly 200 bicycles under a controlled entry system and closed-circuit TV surveillance. The facility will support an array of bicycle-related services, including onsite staff, same-day repairs, accessory sales and bike-related clinics and classes for multi-modal transit riders. Two other Metro Bike Hubs are currently operating at El Monte Transit Center and Hollywood/Vine Metro Red Line Station. Metro’s growing network of Bike Hubs allows bicycle commuters to leave their bikes at stations in a safe environment and avoid the hassle that sometimes comes with bringing bikes aboard crowded trains or exceeding the two-or three-bicycle rack limit on buses. Hubs are also an effective way to encourage “first mile, last mile” connections to transit, which is a common barrier for many would-be transit commuters. The secure bike parking component will be operated by BikeHub, Metro’s Small Business Enterprise-certified contractor that also operates the El Monte and Hollywood/Vine facilities. BikeHub will ensure smooth operation of the bike parking facility for all members. The secure bike parking area is open 24 hours a day and seven days a week. Retail and bike services will be provided by the Bike Center. The company will host bike repair and commute information clinics for community members to learn more about commuting and traveling by bicycle. The bike center will also offer bike valet, tours and bike rentals at the site, and will explore other possible bike-related activities to encourage local bicycle trips. Retail hours will be Monday through Friday from 8 a.m. to 6 p.m. and Saturday and Sunday 10 a.m. to 6 p.m. Parking at the Union Station Metro Bike Hub access will be available for registered users for $5 weekly, $12 monthly or $60 yearly. The low fee structure is designed to appeal to a wide range of customers, including occasional bicycle riders, seasonal riders, regular commuters and non-commuters. Only registered users can park in the facility, which is accessible 24/7 with surveillance cameras and intrusion detection technology to provide increased security. Users can register online at www.metro.net/bikehub. A California identification card/driver’s license or Metro Bike Hub card is used to enter the facility. Users are responsible for locking their bike and gear to the racks. As part of their membership benefit users will also have access to El Monte and Hollywood/Vine Bike Hubs. Additional bike hubs are planned at the Culver City Expo Line Station, Willowbrook/Rosa Parks Blue/Green Line Station, North Hollywood Orange Line Station and the Airport Metro Connector station. For more information on Metro Bike Hubs, visit metro.net. To register to become a Bikehub member, visit metro.net/bikehub. As part of its OC Bus 360° plan, OCTA launched a pilot program at Santa Ana College that allows all students with a valid student I.D. to ride the OC Bus system for free for the first year and for a minimal fee the second and third years of the program. In the first eight weeks, nearly 3,000 students signed up for the program. OC Bus ridership continues to see positive gains in areas where the Orange County Transportation Authority has focused on improving service through the OC Bus 360° program, changes that were implemented beginning just over a year ago. According to the results of a report presented to the OCTA Board of Directors today, bus ridership was up 19.6 percent as of September 2017 compared to a year earlier on routes in core areas of the county where service was improved. Other elements of the OC Bus 360° plan also are showing positive results, including the introduction of additional transportation options and integration of new technologies. The OC Bus mobile-ticketing app offers riders greater convenience for purchasing fares and using electronic ticketing on their mobile device. Since its introduction in the summer of 2016, more than 67,000 riders have downloaded the mobile app, with 300 new app users on average per week. In August, OCTA introduced a pilot program at Santa Ana College that allows all students with a valid student I.D. to ride the OC Bus system for free for the first year and for a minimal fee ($6.75 for full-time students and $5.75 for part-time students) the second and third years of the program. The goal of the pilot program is to introduce students to the convenience and affordability of riding the bus and encourage them to utilize public transit now and in the future. In the first eight weeks, nearly 3,000 students signed up for the program. OCTA will also launch a micro-transit pilot program next summer in two regions of the county where fixed-route bus service was reduced or eliminated. Through that program, which will operate in areas of Huntington Beach as well Laguna Niguel and Mission Viejo, smaller vehicles than the traditional 40-foot bus will provide on-demand transit services that will allow people to share the ride to their destinations. Through Measure M, the county’s half-cent sales tax for transportation, OCTA also will solicit interest from local cities to provide shuttle services to serve specific transportation needs to special events, and popular retail and employment destinations in their area. The uptick in ridership on the improved routes came despite national and regional trends that clearly show that fewer people overall are taking public buses to reach their destination. In Orange County, overall bus ridership declined 3 percent in the second quarter of this year, compared to the same period a year ago. But that’s a slower decline than the nationwide average of a 4.2 percent ridership drop. 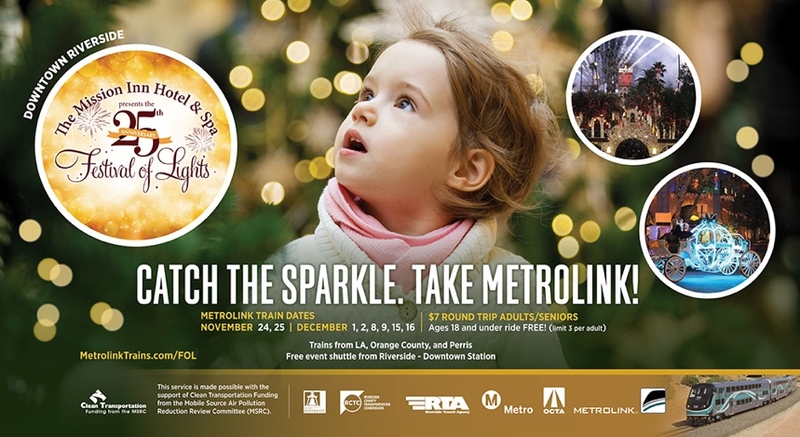 Catch the Sparkle and Take Metrolink! 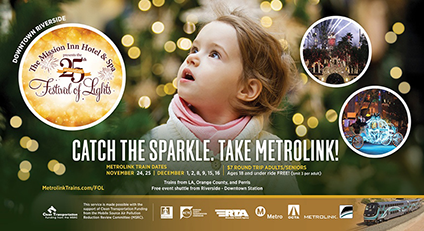 Now in its 25th year, enjoy the Festival of Lights even more with special Metrolink fares – $7 adult round-trip tickets and up to 3 children under the age of 18 ride free. Avoid holiday traffic, parking hassles and take Metrolink special train service to the Mission Inn Hotel & Spa’s Annual Festival of Lights in Riverside on Fridays and Saturdays from Los Angeles and Perris–South to Riverside-Downtown. The Riverside County Transportation Commission (RCTC) in cooperation with Metrolink is providing special train service to take riders from South Perris to Downtown Riverside and from Downtown Los Angeles to Downtown Riverside along the 91/PV line. Service from Orange County will also be provided. Funding for this special service is provided by a MSRC grant. A free shuttle from the Downtown Riverside station to the Mission Inn will be provided by RTA. The beloved Southern California tradition recently named “Best Public Lights Display in the Nation” by USA Today creates a magical, Disneyland-like experience in the heart of Riverside and attracts more than 250,000 visitors from all over the world each year, commencing with the famous “Switch-On” Ceremony, a spectacular event in which the castle-like hotel is instantly illuminated with nearly 5 million holiday lights followed by a full fireworks display. Highlights of Festival of Lights include 200 animated figures including angels, elves and Dickens carolers; appearances by Santa Claus, the world’s largest man-made mistletoe, horse-drawn carriage rides, elf tuck-ins, freshly fallen snow, elaborately decorated Christmas trees among other festive offerings. A new addition this year is the Candy Stroll that will take you down the main walkway, filled with candy décor, under the Campanario with the world’s largest mistletoe, and down the path towards Main Street featuring brightly colored canopy lights, additional candy décor, window displays and more! For more information please visit MetrolinkTrains.com/FOL. 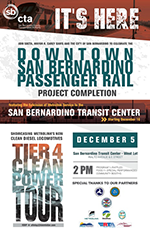 On Dec. 5, the San Bernardino County Transportation Authority will be hosting an event celebrating the completion of the Downtown San Bernardino Passenger Rail Project. Officials representing state, county, city and local transit providers will be on hand to commemorate the milestone. This project extends Metrolink service one mile from the Santa Fe Depot to the multi-modal San Bernardino Transit Center (SBTC) in downtown San Bernadino. The San Bernardino-Downtown station will be the newest Metrolink station on the San Bernardino Line. Metrolink will connect at the SBTC with access to Omnitrans buses, sbX express passenger service busses, OmniGo circulator service and Access ADA service. In 2020, the new Redlands Passenger Rail Project, called Arrow, will open at the SBTC and connect residents and businesses to downtown Redlands and the University of Redlands, among other local stops. 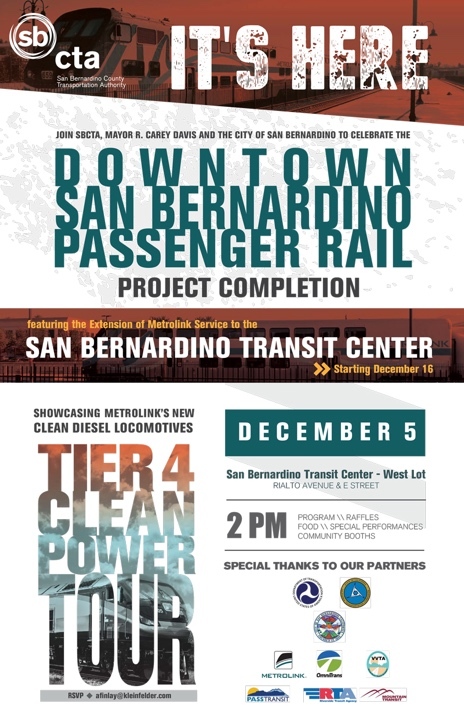 The anticipated opening of the San Bernardino-Downtown station for Metrolink service is Saturday, Dec. 16. What’s your vision of transit in Orange County? Do you want trains, buses, shuttles, or something different? The Orange County Transportation Authority (OCTA) is asking for your help in shaping the future of transit. OCTA wants your thoughts on which transit corridors should be a priority and which strategies they should consider to encourage transit use. Check it out at http://octransitvision.com/. For more information, visit www.octa.net/octransitvision.